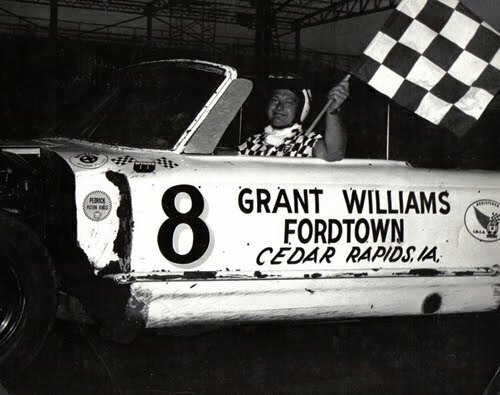 Cedar Rapids, Iowa (September 26, 1965) - Darrel Dake of Cedar Rapids wheeled his 1962 Ford convertible to the 100-lap National Modified Late Model Stock Car Championship before more than 4,000 race fans in near freezing temperatures on Sunday afternoon at Hawkeye Downs. Dake, who started on the pole, took the lead on the first lap in the accident-marred championship feature, and though pressed, was never headed. 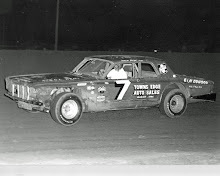 An accident on the 72nd lap sent Buzz McCann of St. Paul, Minn., to St. Luke's Hospital where he is listed in fairly good condition with possible internal injuries. McCann slammed into Lyle McNull of Aledo, Ill., after McNull spun out in a cloud of dust on the second turn. McCann was then hit by Harry Odeen of Marion. 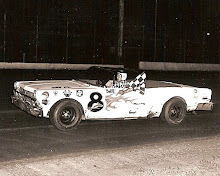 Ben Hofer of Rock Island, Ill., bought the crowd to their feet when he put his 1965 Chevrolet right on Dake's bumper on the 98th lap and stayed there as they crossed the finish line in what was described as one of the most thrilling races ever held at Hawkeye Downs. 1st heat – Buzz McCann, St. Paul, Minn.
2nd heat – Jerry Reinhart, East Moline, Ill.
3rd heat – Mert Williams, Rochester, Minn.
2. Ben Hofer, Rock Island, Ill.
3. Don Bohlander, Peoria, Ill.
4. Herb Shannon, Peoria, Ill.
5. 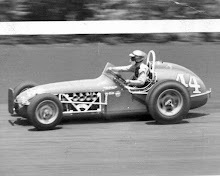 Ray Guss, Moline, Ill.
6. Lyle McNull, Aledo, Ill.
10. Rick McDole, Rock Island, Ill.
12. Shorty Bennett, Moline, Ill.
13. 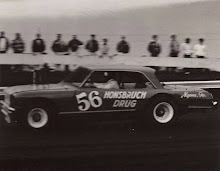 Mert Williams, Rochester, Minn.
14. 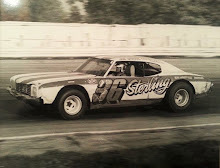 Gary Steffe, Milan, Ill.
15. Del Williams, East Moline, Ill.
17. Buzz McCann, St. Paul, Minn.
18. Dean Montgomery, Milan, Ill.